[WAR OF 1812]. WILLIAM CHARLES. Print. 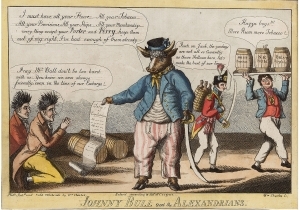 Johnny Bull and the Alexandrians, satirical engraved aquatint cartoon. Philadelphia, Pennsylvania [October, 1814]. 1 p., 13 x 9 in. [Two frightened Alexandrians, kneeling, on left:] Pray Mr Bull don’t be too hard with us--- you know we were always friendly, even in time of your Embargo! The British declared a blockade of the American coast early in the War of 1812, but most of the fighting took place along the American-Canadian border. In mid-1814, the British shifted their attention southward with an expeditionary force sent into Chesapeake Bay. Led by Major General Robert Ross (1766-1814) and Admiral Alexander Cochrane (1758-1832), the British forces captured and burned many government buildings in Washington, D.C. on August 24. Three days later, Gordon’s naval expedition opened fire on Fort Washington, eight miles below the capital and the last line of defense before Alexandria. The Americans abandoned the fort after spiking its guns. As the British were removing gunpowder, a massive explosion shook the town of Alexandria. On Sunday, August 28, the mayor of Alexandria asked Gordon for terms of surrender. Because it was Sunday, Gordon told the mayor to return and he would bring up his squadron on Monday. Facing 128 guns of the British squadron, to avoid the destruction of the town, the mayor and Common Council surrendered on August 29. They agreed to turn over all merchant ships and their cargoes. The British acquired twenty-two merchant ships and vast quantities of supplies, including flour, cotton, tobacco, wines, and cigars. After a short occupation, Gordon’s force returned down the Potomac, somewhat slowed by now heavily-laden ships that ran aground and by harassing fire from American militia batteries on the heights above the river. Gordon rejoined the main British fleet in the Chesapeake on September 9.